One of these catalogs is from 1899 and is by L. H. Mace & Co. of New York. 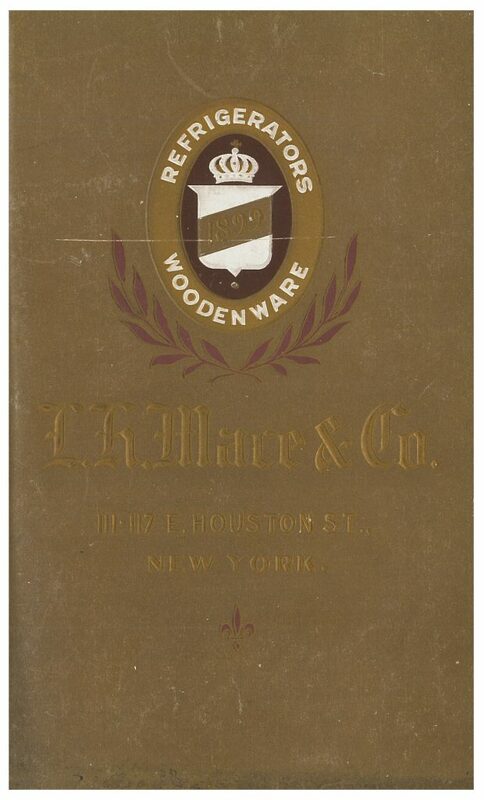 By the time this catalog was printed, L. H. Mace & Co. had been in business for 49 years. The catalog is titled Illustrated Catalogue and Price-List of Refrigerators and Woodenware. L. H. Mace & Co., New York, NY. 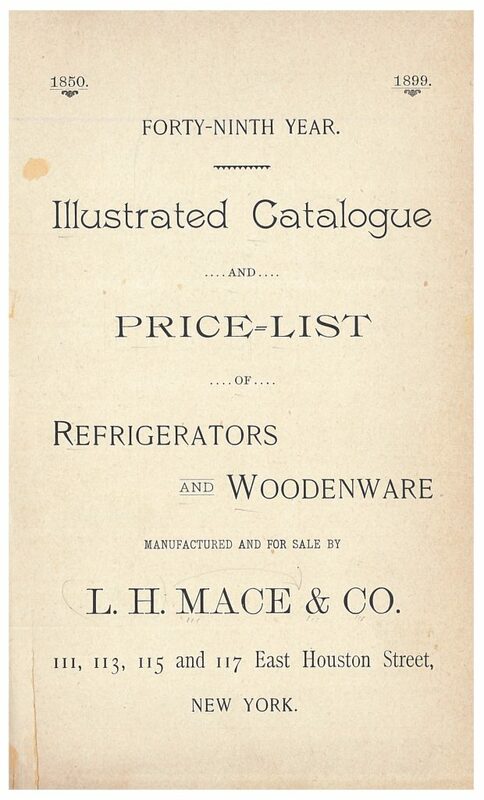 Illustrated Catalogue and Price-List of Refrigerators and Woodenware, 1899, front cover. L. H. Mace & Co., New York, NY. 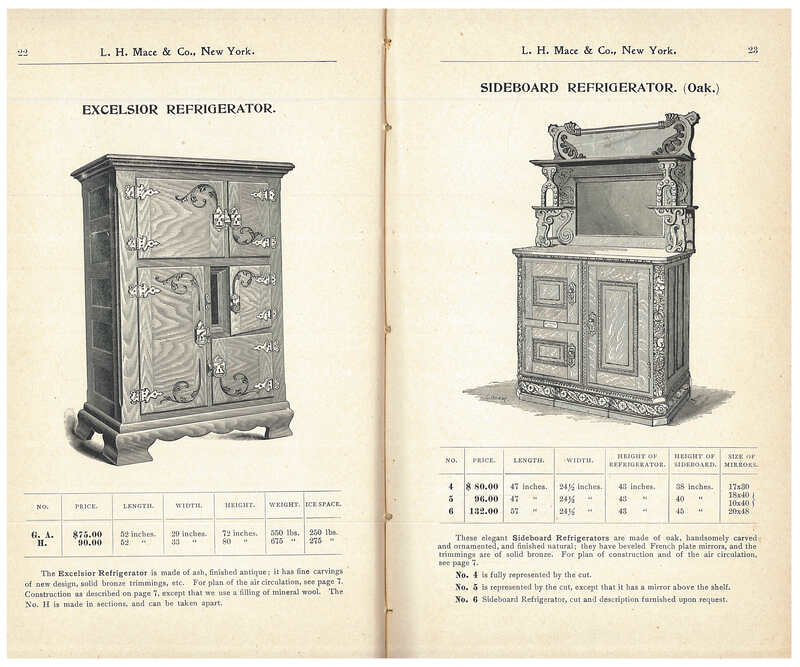 Illustrated Catalogue and Price-List of Refrigerators and Woodenware, 1899, title page. In 1899, the company manufactured five grades of refrigerators including the Diamond, the Special, the Puritan, the Excelsior, and the Glass Lined Excelsior. Refrigerators made for family use in the home were lined with zinc, galvanized iron, sheet steel, or glass. The refrigerators’ inside boxes were constructed of spruce covered with felt paper while the outer casing was made of ash, pine, or oak. That meant there was about an inch of empty or dead-air space between the inner and outer walls. For air circulation within the refrigerators, the system used the principle that cold air falls and warm air rises. The image below is a sectional view of a refrigerator with arrows showing a continuous circulation of dry, cold, and pure air. L. H. Mace & Co., New York, NY. 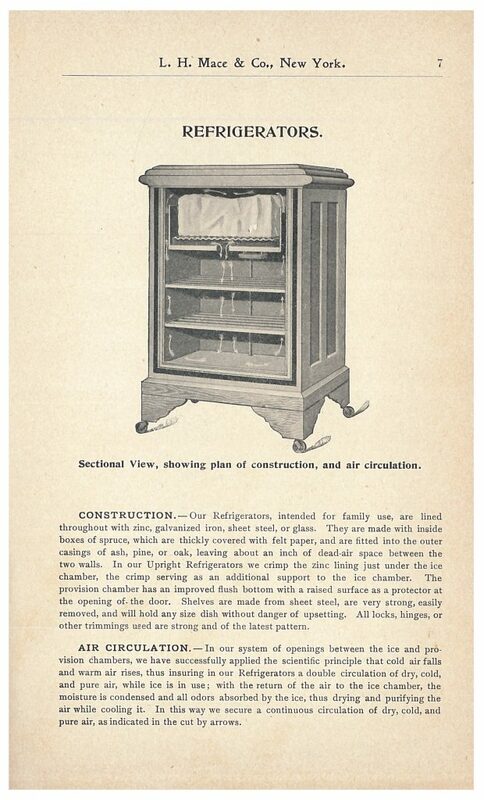 Illustrated Catalogue and Price-List of Refrigerators and Woodenware, 1899, page 7, sectional view of refrigerator showing arrows for air circulation. Below are images of two refrigerators for apartment houses, flats, and family use. These were constructed of ash with mouldings made to match the wood of the room. L. H. Mace & Co., New York, NY. 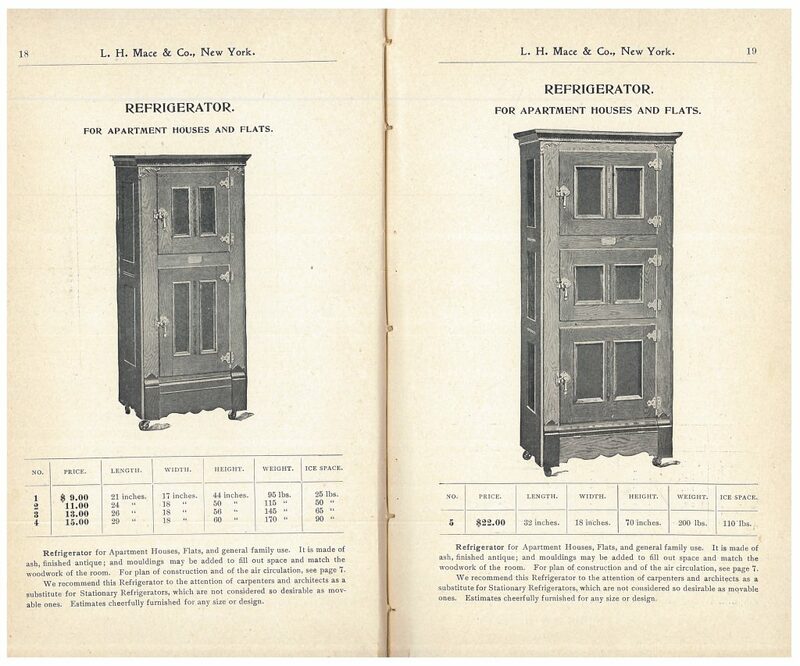 Illustrated Catalogue and Price-List of Refrigerators and Woodenware, 1899, pages 18-19, refrigerators for apartment houses, flats, and family use. Another style of refrigerator was the Sideboard Refrigerator, illustrated below right. It was made of oak decorated with carvings, ornamentation, and solid bronze trimmings. It included a beveled French plate mirror. L. H. Mace & Co., New York, NY. Illustrated Catalogue and Price-List of Refrigerators and Woodenware, 1899, pages 22-23, Excelsior Refrigerator and Sideboard Refrigerator. Other types of refrigerators manufactured by L. H. Mace & Co. included Beer Refrigerators and Restaurant Refrigerators, both illustrated below. The Beer Refrigerator is shown below on the left. It was called the Combination Beer Refrigerator and was constructed of ash with brass trimmings. The lining of the refrigerator was made from wood. Inside the refrigerator were slides for the kegs to rest on. Shelves in the lower part of the refrigerator could be removed making it possible to cool two more kegs. L. H. Mace & Co., New York, NY. 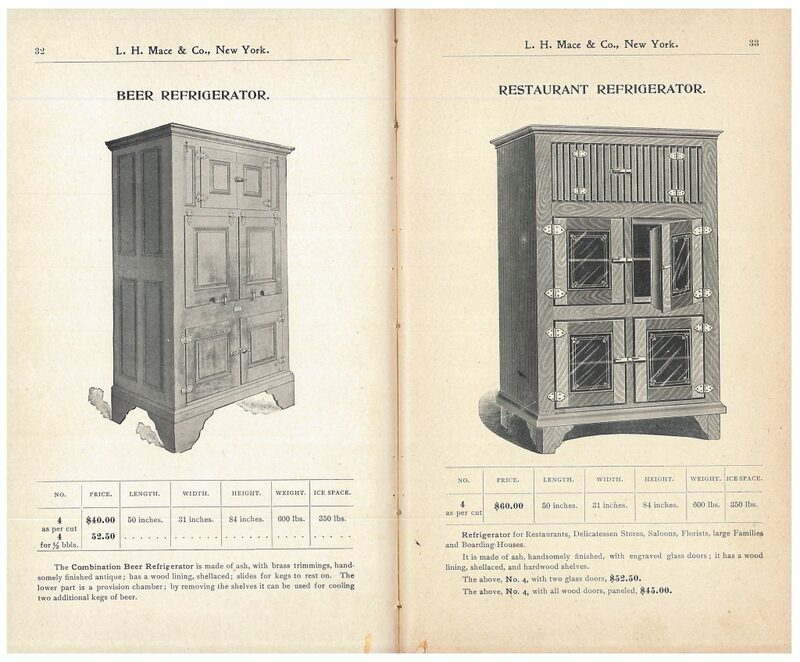 Illustrated Catalogue and Price-List of Refrigerators and Woodenware, 1899, pages 32-33, Beer Refrigerator and Restaurant Refrigerator. Many more refrigerators are shown in this catalog, including Grocer’s Refrigerators, meat safes, refrigerators for ice cream, chest refrigerators, and more refrigerators for family use. Illustrated Catalogue and Price-List of Refrigerators and Woodenware by L. H. Mace & Co. is located in the Trade Literature Collection at the National Museum of American History Library. L. H. Mace & Co. Previous Post Nimm mich mit!